….. but like the idea of socialism itself, this once-inspiring soundbite has been tarnished by its Marxist origins and the history of so-called communist Soviet Union, even though it was not Marx’s fault that Stalin ensured that many people equate communism with totalitarianism. Trying to forget the aberrations of the USSR, there is really no moral alternative to “socialism”, the opposite of which is of course “Every man for himself.” Yet this wonderful idea does not in fact have the universal support it would seem to deserve. Why then do “socialists” so often lose elections? A) “Capitalists” gain power, create lots of wealth and spread a fair bit of it about to keep the plebs happy, but in the end keep so much for themselves and get such a bad image that the people get fed up and envious and demand a complete change. C) The voters lose their idealistic hopes and vote once more pragmatically for the people who can at least create wealth instead of simply stealing it off the most-productive until the camel collapses to the ground. If you look at this in a detached way it is quite funny, since it is a seemingly-endless cycle from which the participants (including the voters) never seem to learn. And the main thing about voters is that they always believe the promises of a new dawn made by all those seeking election. Indeed, anyone idiotic enough to speak the truth along Churchillian lines (“All I can promise is blood, sweat and tears.”) is sure to get an absolute hammering at the polls. You are likely do much better if you promise to reduce taxes and put up welfare benefits, even though it does not take an Einstein to realize that this is impossible. In the UK, success is also usually boosted by the degree to which a pseudo-socialist party slags off any of the following: bankers, capitalists, Tories, toffs, the idle rich and of course Mrs Thatcher – which is also quite funny, except when the socialists win an election and start on the B) part of the above-mentioned cycle. One day we may all be “socialists” (which is really the only moral choice), and will vote merely for different shades of “socialism” and people whose faces we like. However, I doubt whether I shall see this day in my lifetime. In the meantime, if you happen to know any “socialists” who fit the description in 1 to 3 above, do encourage them to go into politics: they are desperately needed. 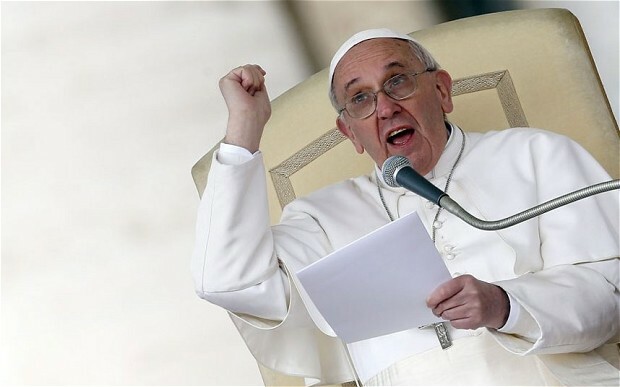 Liberation Theology is back as Pope Francis holds capitalism to account. Amid accusations of Marxism, Pope Francis has turned the Vatican into the spearhead of radical economic thinking. Sometimes I despair – actually MOST of the time. The problem in society is not any “ism” per se, but INDIVIDUAL FLAWS in “Human Nature”. Surely a Pope could grasp this, given the theory of “Original Sin”? ALL of us are “selfish” to different degrees. You HAVE to have SOME selfishness in order to survive. The problem is when the DEGREE of selfishness is excessive. This principal holds for EVERYTHING. Take “greed” for example. You need a bit of greed to be ambitious, and you need ambition of some kind to achieve anything at all. Einstein was “greedy” to understand puzzles about the natural world. Had he not been “greedy” to work out what was going on he would not have solved the problem. An artist has to be ambitious to want to produce something people like and which may make him some money. Without SOME ambition we would not achieve ANYTHING, but be like Syd the sloth in “Ice-Age”. But even he in the end was ambitious to become a good member of “the herd”. An ambitious businessman who wants to make a million dollars is of course “greedy”, but TOO greedy? However, an already-rich Enron executive who wants even MORE millions he can’t possibly need to live very well, and to achieve this behaves in an anti-social fashion to the point of breaking the law? We all I guess would call him greedy. In other words, it is all a question of BALANCE. When things get out of balance, you get problems, and this applies in EVERY field of human activity. There is of course no scientific way of defining what is excessive; it has to be based on commonsensical consensus. To put it another way, SOME people can be extraordinarily nasty and greedy in capitalism, socialism, communism, Buddhism (rarer I grant you) or any other kind of “ism” or “acy”you can imagine, It is not the “ism” that is the problem, but the INDIVIDUALS, and they are like this because it is our nature. Some of us are programmed to do excess. Having grasped this – to me – rather bleedin’ obvious point, the next step is to develop ways to limit excess. We already do this in some areas, the law for a start, but NOT enough in – as it happens – “capitalism”, where greed is allowed an almost total free rein. For example, it was reported a couple of days ago that top CEO’s had by the end of the second day of the year earned as much as the average annual salary for the country as a whole. This is an example of greed gone mad. And it is easily fixable: the govt only has to decree that NOBODY shall earn more than x times average annual salaries. Some would try to fiddle this with other ways of remunerating CEOs, but that could be stopped. Anyone cheating would have their entire wealth confiscated for a start. One has to ask why cretinous governments allow excess. Take storecards, for example. These are credit cards issued by, for example, M&S, on which an insanely-high rate of interest is charged. Unfortunately, some people are idiotic enough to use these cards and end up paying 30% interest or more, WAY above base-rate. But sometimes we have to be protected against our own natures. YES, we want to be “free”; we hate “regulation”, but if this principle were universally applied, then we would have hardly ANY regulations at all, which would be self-evidently insane. Regulation and bureaucracy of course, are yet further examples of the need for BALANCE. You have to have some regulation, but too much is BAD. In the case of storecards, the stores are simply being excessively greedy. They could still earn a decent profit if the cards were – for example – only 100% higher than base rate. SEVERAL hundred % higher is just excessively greedy. What could the govt do? Simply make a law that nobody lending money may legally do so at an interest rate more than x% (to be defined by parliament) above base rate. Housing? How can it not be excessively greedy for some people to own multiple homes while others own NO home and others neither own nor even HAVE a home? This is excessive greed and could be controlled. Most governments, however, lack the courage to control greed, and in the case of housing they are of course all involved in it up to their eyeballs in property wealth. Some MPs have even been imprisoned for fiddling expenses on accommodation ad other things. But we are far too soggy with people AND organisations who do excess (including of course corruption, which can destroy societies completely). Petty thieves are often punished more severely than bankers, for example. And of course the latter have even less excuse, as those involved in the sub-prime scandal knew exactly what they were doing and were abusing trust. AND of course – and rightly – they thought they could get away with it. However, as for “capitalism” in general, NO OTHER SYSTEM is as good at creating wealth, it then being up to the government to decide how that wealth is spread around. The problem with being so pathetic and soggy about excess is that capitalism is unfairly being given a bad name. Unfortunately, a forced return to any other kind of “ism” is just going to mean less wealth and of course more poverty – and NO reduction in excess, even if it is comes in different forms. ”Socialists” may feel more moral at eliminating evil capitalists and reducing everyone to the same level of poverty (as in Cuba and all other “socialist” societies of whatever shade of despairing bleakness) but it will not do their average citizens much good. No, we absolutely need “capitalism” (which is just commonsensical recognition of our nature, that ambition and a certain amount of “greed” lead us to create wealth) but we HAVE to deal with excess. Remember, it is not the “ism” per se at fault, but the INDIVIDUALS operating within ANY “ism” who are driven to excess. That is how we are, and it is pointless to pretend otherwise. Capitalism is flawed, but let’s put it right – not abandon it for something inevitably much worse. The difference between what CEOs get paid as compared to the lowest employees in their company has increased by 1,000 per cent since 1950. Bloomberg did an extensive study of the annual pay of top executives as compared to their entry-level staff and found that CEOs make on average 204 times the regular salary but the differential is much more striking in certain retail companies. The biggest offender comes in the form of JC Penney, where their latest CEO Ron Johnson, who was recently fired, left with a $53.3million compensation deal. That is nearly 1,800 times the $29,688-per-year earned by the department store chain’s cashiers. What recession? Public company CEOs paid on average $9.6 million, and it takes the average US worker a month to earn the $3K that they make in an HOUR. CEOs running health-care companies made the most: $10.8 million – no wonder healthcare in the US is so expensive. Viacom’s CEO Philippe Dauman earned $84.5million last year, the highest among the executives, according to the report. Dauman, 54, more than doubled his compensation from $34million in 2009. Occidental Petroleum Corp CEO Ray Irani, 76, received compensation valued at $76million in 2010. He was followed by Oracle Corp CEO Lawrence Ellison, 66, who received $70million. Abercrombie and Fitch CEO Michael Jeffries earned more than $36 million. They work for nonprofits but earn more than $1 million a year. An elite list of 10 charity chiefs are commanding astonishing seven-figure salaries, according to a new study by Charity Navigator. The eternal left-right sniping which often descends into snarling, bilious invective and outright class hatred is truly pathetic. One would think we still lived in the 19th century and that the Enlightenment had passed us by. In the following analysis “capitalist” includes entrepreneurs of all sizes, including your local window cleaner or Pakistani shopkeeper and people like Geoff Dyson or Richard Branson. A) “capitalists” are ironically “socialists”‘ best friends, though you would not believe it from the childish goings-on in British politics. B) Without the former there is no wealth creation and thus no money to spend on welfare, crap education, the Millenium Dome, the 10 billion non-functioning NHS IT system, aircraft carriers with no aircraft and the 23 million GBP NET per day to the EU. C) Correspondingly (just to make it clear, even though it is already bleedin’ obvious) the more wealth that capitalists create the more money socialists can spend (and of course waste). D) In their wealth creation (at which they are good and socialists totally useless) the capitalists also create jobs, which – according to what they say at least (but who believes anything they say?) – is one of the socialist’ main preoccupations. E) So, wealth creation is good; without it, there is poverty and misery. Socialists cannot of course create their own money, only spend other people’s. Therefore, you would think they would bust a gut to make it easy for someone else to make money so that they (the socialists) could take some of it for their good works. F) However, rather than do the bleedin’ obvious, socialists usually revile capitalists as “evil” exploiters of others, especially if they are also Tories, so that the collocation “evil Tories” is one of the most commonly heard in left-wing circles. G) Because wealth-creators are per se evil, socialists usually do their utmost to prevent them creating wealth by taxing them to the point where it is not worth their while to flog themselves to death creating it, whereupon they either give up or move their businesses abroad. The socialists’ hatred for – and suspicion of – capitalists also frequently leads the former to impose such a tsunami of regulation and barriers to employment that little wealth creation is possible, especially as we are competing in a global market. (See France yet again). As it happens, I have a sneaking regard for the aspirations per se of many “socialists”, including for example Tony Benn. The problem is that they simply cannot grasp the above and why it is absolutely vital to encourage rather than revile “capitalists”. This makes it quite impossible ever to vote for them. And as they do so much to restrict capitalists from creating wealth they of course do not have enough money for their schemes, which leads them to borrow and/or print money for the latter, a cunning plan which works in the short term but is catastrophic over a longer period (see France, USA, GB and just about every other feckless, incompetent and moronic government in the developed world). “EXPLOITATION”: Doing work for someone does not mean that they are exploiting you; it all depends on the contract. Many humans are by nature quite nasty (whether capitalists OR socialists), and so degrees of protection are required to prevent exploitation in ANY direction. It is not beyond the wit of Man to set up such protection, but it is usually overdone (especially by socialist regimes) in a futile attempt to create “fairness”. Thus it is that France has very high job protection but correspondingly high endemic unemployment (and now a collapsing economy and society) while Denmark has much looser hire-and-fire regulations and ALWAYS has much lower unemployment than France. WEALTH-GAPS: Extreme differences of income & overall worth are obscene. This is a value-judgement of course, but based on the practical observation that throughout history ALL societies where wealth-gaps have become absurdly gross have in fact collapsed. Therefore, income and wealth levels should be capped at a point which does not discourage wealth creation but avoids the absurd situation as in the USA where a CEO of a major company may earn over 530 times the average income of those in his company. “The richest 1 percent of Americans now take home almost 24 percent of income, up from almost 9 percent in 1976. As Timothy Noah of Slate noted in an excellent series on inequality, the United States now arguably has a more unequal distribution of wealth than traditional banana republics like Nicaragua, Venezuela and Guyana. INHERITANCE: You can never create a “fair” and/or “equal”society (if that is what you want) while inheritance is permitted. It simply means that the rich get much richer over the generations. At the lower levels, it means that during their entire lives a large part of society has to pay nothing for mortgage or rent while a larger part has to spend an increasing proportion of their incomes on the same, with many never being able to say that they live in a home of their own, unlike of course cavemen, Indians, African tribesmen and Eskimoes. However, almost all societies are wedded to the idea that one has an inalienable right to pass on one’s property to someone else, so this one is a non-starter. If that is the case, then you have to accept vast wealth-gaps – as indeed we already have (and they are getting ever bigger). And vast wealth-gaps always lead in the end to collapse, revolution and often dictatorship. B) You can’t have your cake AND eat it. C) Consistently spending more than your income leads to ruin. All of these are obvious to everyone except our so-called leaders. – A true British socialist is one sufficiently well off not to have to bother about the economic meltdown he or she brings about through the utter and incompetent misuse of money taken from people who create it (usually lumped together with yawning sneers as “capitalists”). – The true elite British socialist is a great thinker, usually in some posh part of the country such as Hampstead, where he or she is surrounded by like-minded people, almost all of whom have never done a real job such as postman, check-out assistant, dustman, farmer (unless country gent) or bog-cleaner. – Having thought at great length on behalf of the plebs (for which of course the latter should be eternally grateful) and after a formative passage from prep to public school and then on to Oxbridge the true socialist is now well-equipped to set about his self-anointed task of bringing his country’s economy to its knees on behalf of his less-privileged fellows. – Once the inevitable collapse of the economy has been accomplished but after a brief period of delusional voter-bribing euphoria during which it is announced that bust and poverty have both been abolished to be replaced by perpetual boom then he or she then retires to his or her Hampstead (or Scottish) retreat or indeed his or an oligarch mate’s yacht in Monaco and sends best wishes to the plebs left behind while blaming it all on the incoming government and of course Mrs Thatcher. – Of course, not all true socialists are effete and idle thinkers in Hampstead. Some inhabit leafy rural towns and villages well away from the problems created by their gurus. The archetypal true British socialist has a very large income wrenched by the sweat of his or her – or often someone else’s – brow and wisely invested in a large property from which he or she can rail against the unfairness of non-socialism while refusing the overpowering temptation to exile him or herself to a foreign true socialist paradise such as Cuba, where the people are dirt poor but rumoured to be deliriously happy even though those trying to escape are locked up as lunatics and/or traitors. – Finally, a true socialist is of course someone who sneers at anyone with a contrary view, labelling them “clowns”, “fruitcakes” or indeed “idiots”. In this respect true socialists are no different from idle, effete, over-privileged capitalist tossers such as David Cameron and Ken “I’ve never-been-right-before-and-I’m-not-going-to-start-now” Clarke. – The true socialists are voted into power and get on with doing what they do best. – A weary public eventually gets fed up with spin, debt, poverty and chaos and votes them out. – A nasty, vicious, capitalist right-wing bunch of utter toffs replaces them – aided and abetted by moronic Liberal-Demopratts landed from another planet – and sets about putting the damage right. – This involves a certain amount of pain and sacrifice, though not by the true British socialists sending goodwill messages from their yachts, Scottish castles or indeed leafy East Anglian enclaves, or indeed the House of Lords. – The (it must be said) fairly moronic and long-term suffering but short-term memoried British public soon gets fed up with living within the country’s means and votes the true British socialists back into power, thus completing the cycle for another round of the same game. – The top former true British socialists who ran the country into the ground get made Lords and/or sent to Brussels as Commissioners or in Blair’s case no doubt made eventual World President and roving Chief-Pontificator to the Masses, or rather to select groups of capitalists who pay him 50,000 GBP a session to hear his pearls of wisdom. – However, in true Greek-hubris style it seems that the “clowns” have had the latest – if not yet the last – laugh, which of course is entirely appropriate. PPS Capitalism: a system whereby people who don’t want to be poor beg, borrow, earn or inherit money and use it to create wealth, some of which they are happy to give to the rest in the form of taxes but also in the occasional donation (see “Bill Gates Foundation”). What is needed is socialism with brains and pragmatism, not dogma. More wealth is created when people’s natural desire (for better or worse) to improve their lot is given some slack. The consequence is LESS wealth. This means LESS to spend on socialist goodies, such as billions on idiotic wasteful projects, quangoes, vast pensions for mandarins etc. This is the problem with “socialists”. They don’t know when to STOP and let the people get on with creating WEALTH. They kill the golden goose and the camel collapses. We ALL would like to spend an INFINITE amount on the NHS, education and so on, but you have to EARN THE DOSH FIRST. Socialists usually put the cart before the horse. Bleedin’ obvious, innit? But not apparently to the British Labour Party. What the Americans have done is wage a “financial” war on Cube for over 50 years. A) The USA has a right to trade with whom it wants. If ALL nations refused to trade with fascists then perhaps the latter would collapse more quickly. Presumably you are quite happy that we traded with Gaddafi for decades and thus supported his evil regime which is now murdering its citizens with the weapons we sold him. Yes, I’d be happier if the US would refuse to buy oil from Saudi Arabia, China et al as well. However, nobody’s perfect as they say. B) The Cuban “government” has waged economic war on its OWN people for 15 years, banning the most basic and widespread economic practices in use ALL OVER THE WORLD except in insane “socialist” regimes where economic insanity is imposed “for the good of the people”, who of course are happy as we are told. So nutty have been these practices imposed on the Cuban people WITHOUT THEIR CONSENT in ANY shape or form that Cuba – no longer bankrolled by the murderous Soviet Union (see KGB, Stalin, murder in London of Litvinenko history of) – is rapidly going bankrupt, perhaps to be saved by oil and to turn into yet another nauseating oil-rich dictatorship. These economic practices are indeed SO daft that Castro is now going to RELAX them … not that you’ll hear him apologize for the 50 years of impoverishing lunacy.